Silvio Guitan performed on Show 293, recorded July 2014, at age 18. 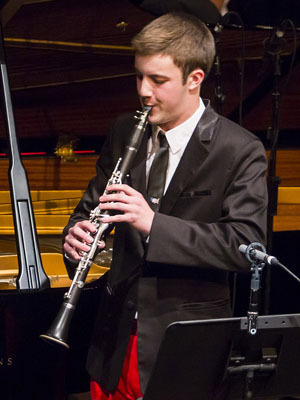 Silvio Guitian (clarinet), 17, is from Baltimore, Maryland, where he is a student at Baltimore School for the Arts. He studies clarinet with David Drosinos. He plays in the Peabody Youth Orchestra and was in the Maryland All-State Orchestra in 2012 and the All-Eastern Orchestra in 2013. He is in his school’s Jazz combo and he plays piano in a rock band with his friends. He enjoys the outdoors, especially swimming, hiking, and climbing trees.